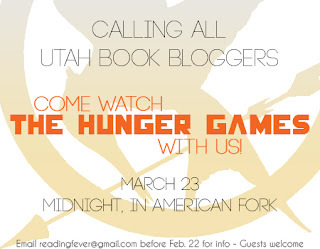 It's All About Books: The Hunger Games Midnight Movie Party! Utah Book Bloggers! We want you to join us for a midnight showing of The Hunger Games! Bring your friends and family too! I'll even give you a ride if you live nearby. Yep. It's true. Penelope of The Reading Fever has planned it all, so if you are interested email her at readingfever AT gmail DOT com and she'll give you all the details. She needs to hear from you before Feb. 22 so she can buy all our seats as soon as they go on sale. Oh, this would be so much fun!